MPs are set to vote on a series of amendments to a neutral government motion on Brexit. Seven amendments were tabled and Speaker John Bercow selected three to be debated and voted on. Indicative votes are where MPs vote on a series of options designed to test the will of Parliament to see what, if anything, commands a majority. If more than one business motion is submitted, Bercow will decide which one has "precedence"
This amendment has cross-party support including from Conservative Dominic Grieve and Labour's Hilary Benn, who is also chair of the Brexit Committee. If the UK is seven days away from leaving without a deal, government must allow MPs to vote on whether to leave without a deal or request an extension "to give time for Parliament to determine a different approach"
This amendment is also supported by Independent Group MPs. Who are the Independent Group and what do they want? Mr Quince's amendment has support from DUP Westminster leader Nigel Dodds and members of the European Research Group including Jacob Rees-Mogg. If a deal is not passed by Thursday, the government has to set out how it will ensure the UK does not leave without a deal on 12 April, "including by seeking an extension to Article 50 to take account of any conclusions reached by the House"
Her amendment has support from Conservatives Oliver Letwin, Caroline Spelman and Nick Boles - as well as from Labour MPs and the Independent Group. Their amendment also has support from the Liberal Democrats. 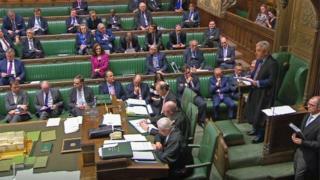 Brexit: What are indicative votes?